The Rightline Gear Sport Car Top Carriers use Dual Seam Technology to bring our PVC Semi-Coated Mesh XT and Hydrotuff Material together. 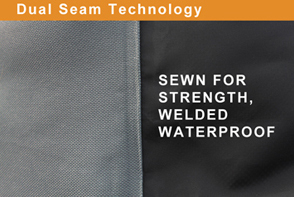 The two materials are sewn together for strength and then welded along the stitching to make the seams waterproof. The Sport Car Top Carrier’s top, bottom, front and back are made from our PVC Semi-Coated Mesh XT, our premium polyester re-enforced PVC. The polyester grid inside the PVC gives it added strength and makes the material resistant to tears or cuts. 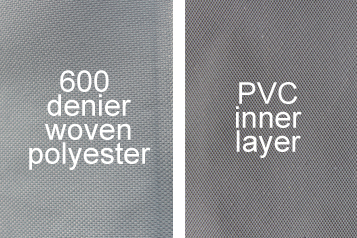 PVC Mesh is waterproof and perfect for use in a cargo bag as it can be welded to form watertight seams. PVC Semi-Coated Mesh XT is also used in our Cargo Saddlebag Car Back Carrier. 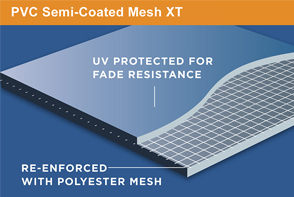 PVC Semi-Coated Mesh XT remains flexible in extremely hot or cold temperatures. It is rated at UPF50 for UV protection, which means it blocks 98% of the sun’s harmful rays. The attractive black color will not fade over time. All of our logos are screen printed on the material and sealed in place. It is difficult to find a durable material that can fold down small for storage, but PVC Semi-Coated Mesh XT meets the challenge (see our stuff sack photo)! 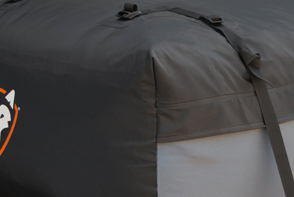 The Sport Car Top Carrier’s sides are made from our specially formulated Hydrotuff Material. Hydrotuff consists of a 600 denier woven polyester outer layer mated to a PVC inner layer. The resulting combination is a high quality, great looking, waterproof material perfect for use in a cargo bag. Hydrotuff is also used in our Cargo Saddlebag Car Back Carrier. Hydrotuff Material keeps its properties in extremely hot or cold temperatures. It is rated at UPF50 for UV protection, which means it blocks 98% of the sun’s harmful rays. The material’s color will not fade over time. All logos are screen printed on the material and sealed in place. Hydrotuff Material has been used in our cargo bags for years and has yielded nothing but positive results. The combination of these two materials make the Rightline Gear Sport Car Top Carriers highly durable and 100% waterproof.